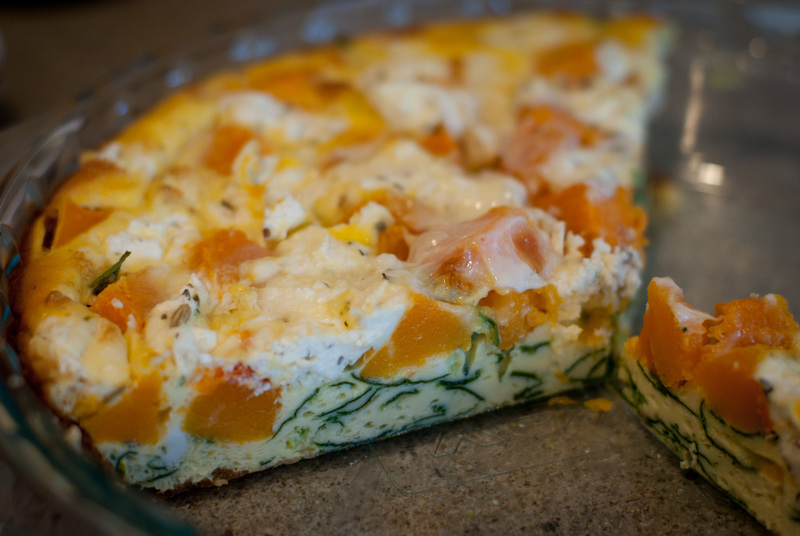 crustless (gluten-free) butternut squash quiche | gluten-free glory! I’ve been using the phrase, “growing up” often on this blog lately, but I need to use it again: growing up, quiche was one of my mom’s standbys. From what I remember, she usually made it for dinner, and usually with cheddar, ham, and broccoli. And those fabulously easy, ready-made, frozen (not gluten-free) pie crusts. So good. One of my “resolutions” for the New Year was to start eating better. I have gotten into a terrible habit of waking up early for work, but then wasting all kinds of time on Facebook, email, and Google Reader…so much time, in fact, that I’m usually racing out the door to try and make my train on time. Instead of starting my day slowly, deliberately, and with good, nutritious food, I’ve been filling it with Internet noise – some good, some not so good – and lots of sugar and caffeine. So, in an effort to start eating better – and maybe give myself more of an excuse to enjoy my breakfast in the morning instead of racing out the door last-minute – I decided this week to make a quiche. And not just any quiche, but an almost-100% local quiche, made with tasty ingredients fresh from the Somerville Winter Farmers’ Market. Shopping there is my new favorite Saturday morning routine: wandering around the market trying out new foods, talking with farmers and foodies and artisans about how they got started, listening to fun music, and feeling the quirky Somerville vibe all are super fun ways to kick off the weekend. Especially when I leave my cell phones at home and can feel totally disconnected for a bit – or when I run into coworkers or other neighbors unexpectedly! So fun. I threw this quiche together on Monday night and have been eating it every morning for breakfast since. It’s not quite as filling as I would have liked, but it’s so tasty and nutritious, I feel really good eating it. The lavender in the herbes de provence cheese is heavenly, especially with the butternut squash’s natural sweetness. Here’s a bit more eye-candy – the recipe follows! Preheat oven to 350 degrees. Break one egg into a small bowl; mix to break the yolk, then pour into the bottom of a 9-inch pie pan. Layer first the spinach ribbons, then the cubed butternut squash, then the cheese and spices. Mix the remaining 5 eggs and milk in a separate bowl and pour over the quiche ingredients. Bake in the oven for 35 minutes; remove and serve while still warm, or let cool, cover with plastic wrap, and store in the refrigerator. This is great cold or warm in the morning – however you like it! So what are you going to make next. Hmm…not sure! I have a couple of photos I could create posts for, like a chicken stock and a tasty salad I made a couple of months ago. What are you making next? Something Valentine I am not sure myself. How are your cake and cupcake adventures treating you? 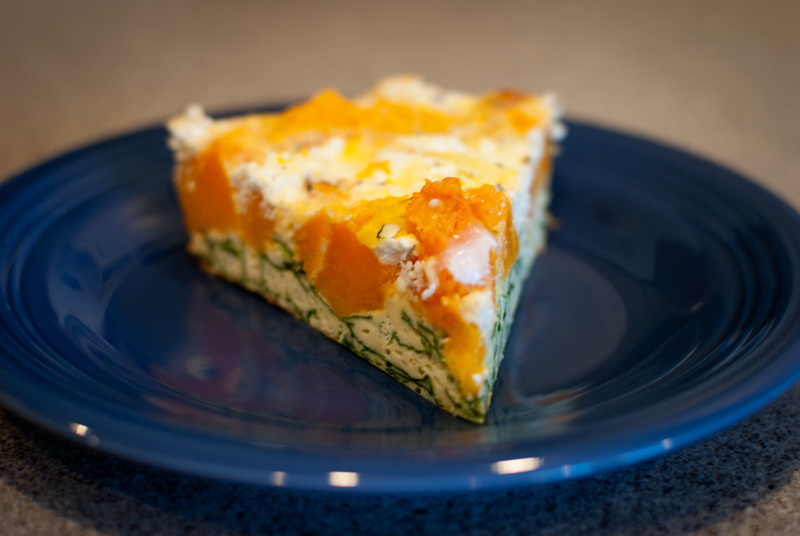 Pingback: chorizo & cilantro quiche « gluten-free glory!